Australian flyhalf enjoyed the perfect start to his Top14 Rugby career as he led Toulon to a 52-8 thrashing of Montpellier on Saturday. Cooper flourished behind a dominant pack, Fijian winger Josua Tuisova scoring a second-half hat-trick as the home side ran in eight tries to one for a well-deserved bonus point. “You can see with Quade that after just two training sessions, he’s very much at ease!” Toulon centre Maxime Mermoz said. 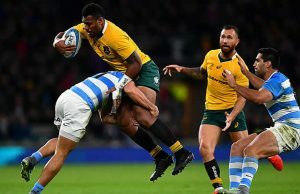 Cooper was little used by the Wallabies in the World Cup, but showed few signs of ring rustiness in his first run-out for the three-time European champions. “I’m very excited to be here and to start off with a win like that you can only dream of,” said 27-year-old Cooper. 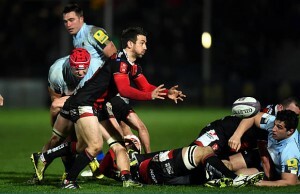 “As a team we had ambitions and the goal to go out there and win with a bonus point. The way we went about that was to play a hard game at the start and then use the backs. His fallibility and genius were both on show in the first-half, a no-look grubber setting up the second of Lachie Turner’s tries but a forced one-handed sling pass leading to Montpellier’s intercept try through Julien Malzieu. Toulon might have been missing the likes of Bryan Habana, Matt Giteau, Drew Mitchell, Ma’a Nonu, Leigh Halfpenny, Duane Vermuelen, Paul O’Connell, Frederic Michalak and James O’Connor, but they could still afford to field a star-studded team packed with experienced internationals. Bernard Laporte named nine foreigners in his starting Toulon line-up, Montpellier coach Jake White plumping for a staggering 11. There were a further eight foreigners on both benches in a sharp realisation of the globalisation of the Top 14, where clubs are funded by multi-millionaire owners. In this case it involves Mourad Boudjellal, who has bankrolled the star-studded Toulon team through the millions made from his comic book empire, and Mohed Altrad, who made his millions in scaffolding and cement after a tough early life that saw him start out as a bedouin in the Syrian desert. In an ironic twist, even the referee was a foreigner: Argentinian Juan Silvestre officiated the game in English. Toulon scrum-half Jonathan Pelissie sent a penalty effort wide early on in a cagey start by both sides. Montpellier’s loosehead prop Bees Roux paid the price for three collapsed scrums in the opening 10 minutes, Silvestre brandishing the yellow card. Delon Armitage, with a clear two-on-one, failed to pass to his brother Steffon with the line beckoning, Montpellier’s Australian captain Ben Mowen also shown yellow for a ruck infringement in the build-up. Toulon finally broke the deadlock after 21 minutes when American lock Manu Samoa split the cover to sprint in from 30 metres for a try. With Montpellier’s defence in disarray, Toulon skipper Juan Smith managed a great inside pass to Turner for a second home try at a sun-kissed Stade Felix-Mayol. Turner crossed for his second just two minutes later, Cooper producing a beautiful, no-look grubber for the winger to touch down over the line. Ben Lucas finally got Montpellier on the board with a 36th-minute penalty before Cooper handed the visitors a lifeline back into the game. A forced pass was intercepted by ex-Clermont winger Malzieu, who outran Turner over 70 metres, Lucas going wide with the conversion. Toulon nailed an attacking bonus point when Fijian winger Tuisova scored the first of three quick-fire tries, played in after Cooper held up his pass from close range. Tuisova scored his second after Malzieu was sucked off his line from a five-metre scrum, allowing the Fijian a free run-in and Anthony Floch’s misspass was picked off by Tuisova, who sprinted in for his hat-trick in the 62nd minute. Ubiquitous No.8 Steffon Armitage was at the back of a driving maul to dot down for Toulon’s seventh try, before France scrum-half Sebastien Tillous-Borde rubbed salt in Montpellier’s wounds, cutting back in for a fine try after being played in by Georgian giant Mamuka Gorgodze and Juan Martin Feranadez-Lobbe following a turnover, converted by former All Black Tom Taylor.